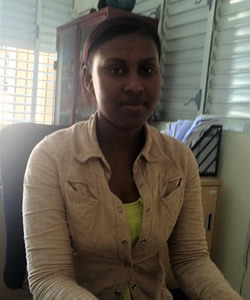 Background: As part of the Education and Social Justice Project, in June 2017 undergraduate student Mary Breen interviewed Noris de los Santos, a receptionist at Border Solidarity (Solidaridad Fronteriza) and teacher at Christ's House (El Hogar de Cristo) in Dajabón, Dominican Republic. She explains that Christ's House runs two shelters for unaccompanied Haitian migrant boys. These shelters offer formation with the ultimate goal of integrating the boys back into their country of origin with new access to formal schooling. The shelters operate in Dajabón, Dominican Republic, and Wanament, Haiti. How long have you worked at Solidaridad? How long have you been a teacher at El Hogar? Can you tell me a little about the mission of Christ's House? The mission is to provide comprehensive protection to unaccompanied migrant Haitian boys in the border area that were found living in the streets of Dajabón. [The program] offers educational, emotional, legal, recreational, and health assistance until the children obtain the protection and guarantee of their human rights. Can you describe the background or situation of some of the boys before they come to the shelter? Before the shelter, they are on the street. They pass by the fried chicken store and either beg or eat leftover food on the plates. This is what they are picking up. They were sleeping in the park or in any place. Now, at the shelter, the boys can receive breakfast before leaving. They receive food and have a bed where they can rest and a place where they can bathe, play, have fun, and do other activities. What are the main reasons the boys cross the border? Many cross because they do not have parents, or they have parents but they do not live with them. They may have been separated or mistreated. Many times they are not attending school, or they go hungry. They may not have a place to sleep. That is why they decide to cross to this side with the dream that here they can beg or clean shoes or do anything else to get a little money. Is it true that the majority of these boys do not attend school here in the Dominican Republic? Yes, not a single boy of the shelter attends school. Is the reason that it is too difficult without papers? Yes, they do not have papers. They are undocumented. Why do you think the boys stay in the Dominican Republic and do not return to Haiti, even if there is not work, school, food, or family for them here? Many times they return to Haiti for a period of one, two, or three months, but then they return. Do they return because there are relatively more opportunities and development in this country? Yes. When they feel the necessity of seeing and visiting their family, they go back. Then, they return here to the Dominican Republic. During the day, what do the majority of the boys do? During the day, some clean shoes and others are at the front of companies like the supermarkets or banks covering the motorcycles from the sun so that the people who visit these places may give them 10, 15, or 25 pesos—whatever the person considers giving. Others have small jobs washing cars or helping with the boxes at the market, and others are just playing in the park. Why are they all boys? Why are there not many girls that cross the border? Here in this country, the girls have a little more care than the boys since the girl is the person cared for most. When Christ's House began, there were only boys in the streets. In the shelter, we do not have space to receive boys and girls, so for this reason we only receive boys for now. In their adolescence, we are not able to mix them easily. Can you explain the formation and classes that the boys receive at night? At night, after they eat, we try to give them some formation. It is difficult when they leave or are in the streets and do not stay, but we intend to do this. Apart from me, there are two other people that are teaching crafts, and another person teaches painting. We try to teach the boys at least how to write their names and to teach some values that are living together, respect, fellowship, and hygiene. What is the object for the long term? There is another house in Haiti that has existed for one year and is financed by a family in Miami. Fifteen boys are able to cross into their country and enroll in school. They try to contact the boys’ families so that they can be with their families in the future. They try to create a familiar environment so that they feel like their families want them there. In the other shelter, the boys attend Jesuit schools, correct? Yes, the school of Fe y Alegría. Do you think it is important that they attend a Jesuit school specifically? Yes, because education in Haiti is very costly. The schools are very expensive. In my experience, the majority of the schools are private and costly. So, the schools of Fe y Alegría, supported and created by Jesuits, are free, and the education is very comprehensive for all of the children who can attend. With the shelter in Dajabón, how long do the boys normally stay? For many years? No, with this shelter here we intend for some to pass to the other shelter in Haiti every year. We have seen that some of the boys here have families, so with the help of a man who works with migrants, we are going to see if it is possible to locate their families and for them to return. From your experience, how does the shelter transform the boys? The shelter is not easy for all of them, because during the day they are on the street. With the fact that there are people that support, love, and worry about them, they feel good with just this. Of course, we have our rules, so anyone who does not obey them cannot be there. They learn to follow rules and to live together in the shelter. On the street, there is no one to chastise them and there are no rules, but here there are. What do you think is novel or special about Christ's House? I would say that Christ's House is sustained by support and donations, but the donations come from people in other countries and places, not inside the province of Dajabón. The people in Dajabón and the authorities here are very indifferent to this work. This could be work of the entire community, since the boys were living in the streets, and that affects all of the community members. Do the people in the neighborhood of the shelter support or like this work? At the beginning, they did not like it. All of the balls that cross from the boys’ soccer games, the neighbors does not want to return them. They are always saying things and fighting when the ball crosses a patio. How do the majority of the boys learn Spanish? Do most of them speak Spanish? No, but they learn on the street among themselves, and many times we help them in the classes at the shelter. Along with Spanish, what other specific topics are taught? Mathematics, movies with values, writing, reading, drawing, values. It is a varied program. They also practice sports. For you, what is the most important change needed here at the border? The poverty at the border is very difficult. Many cross the border for a better life. The poverty and the disintegration of the family. Boys leave their houses because they are mistreated or have a separated family.